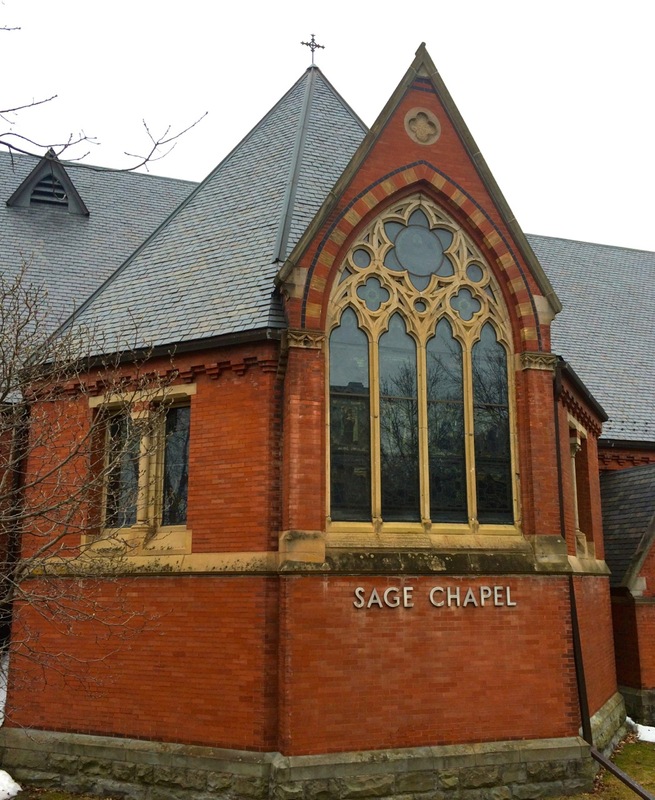 Cornell University has hired a design team that has assessed the current conditions of Sage Chapel in order to carry out a large preservation effort. 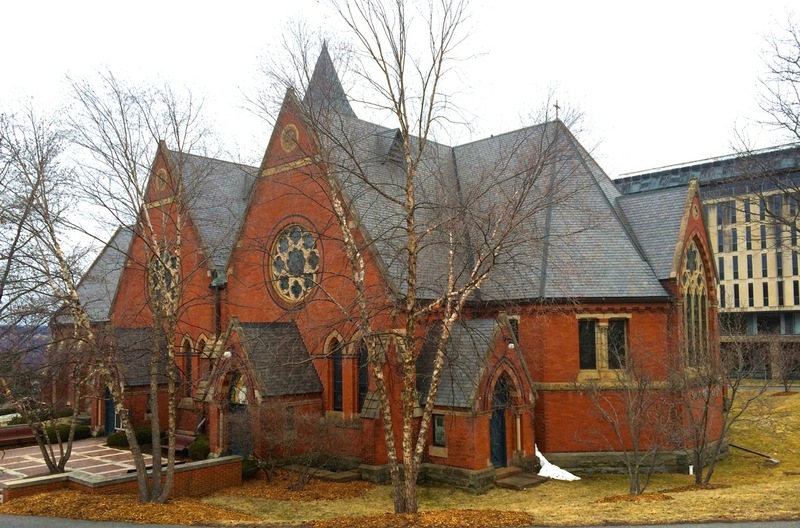 The primary motivators for the project are the conditions of the slate roof, roof flashing, and brick and stone masonry. 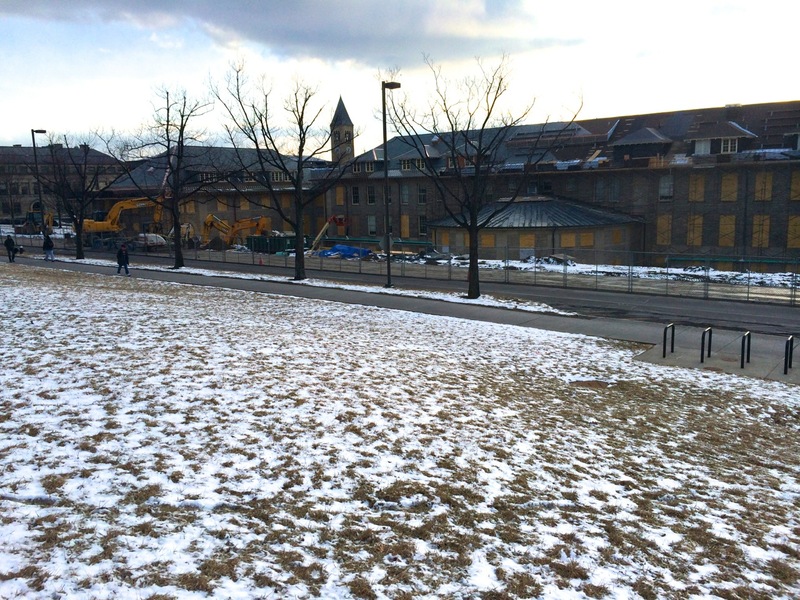 The lead architect, John Milner Associates specialize in historic preservation, the same group that has assessed and designed the repairs for the Washington Monument, which will be reopening May 12th this year. 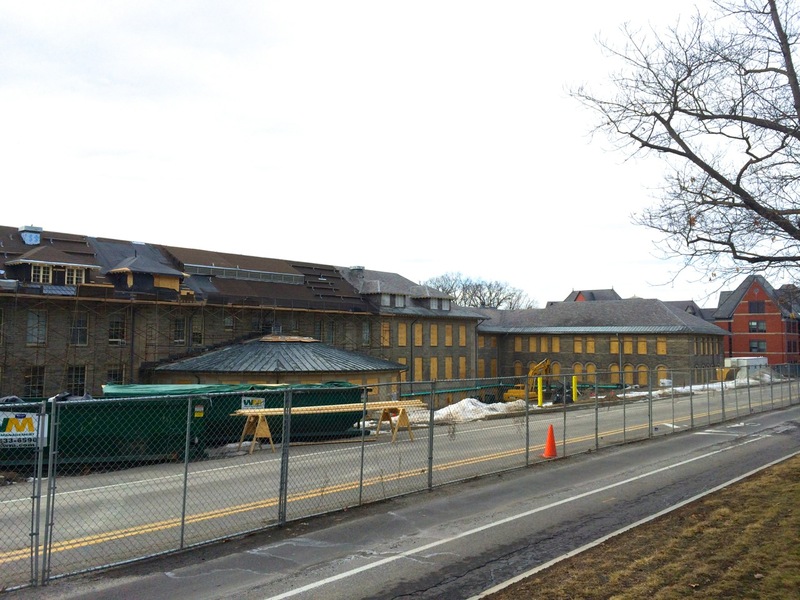 Robert Silman Associates has been working on the structural engineering aspects, along with Princeton Engineering Group for mechanical engineering needs. 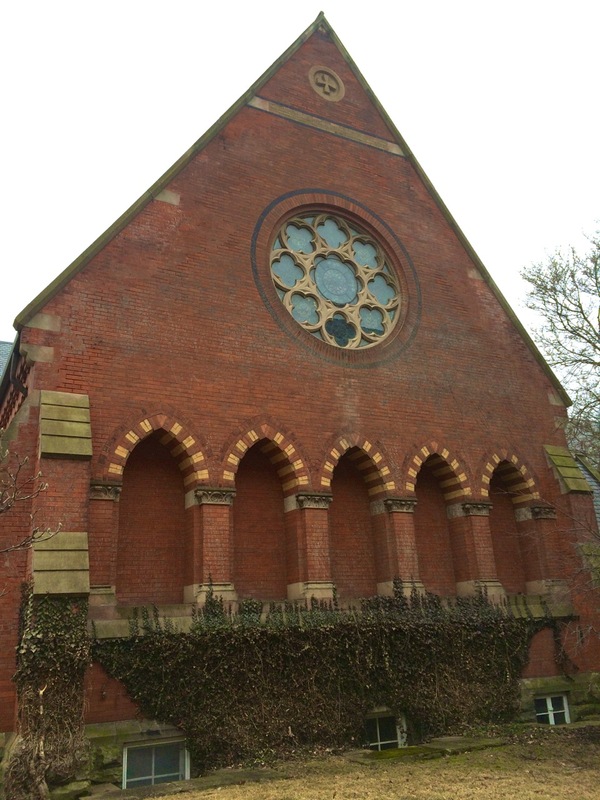 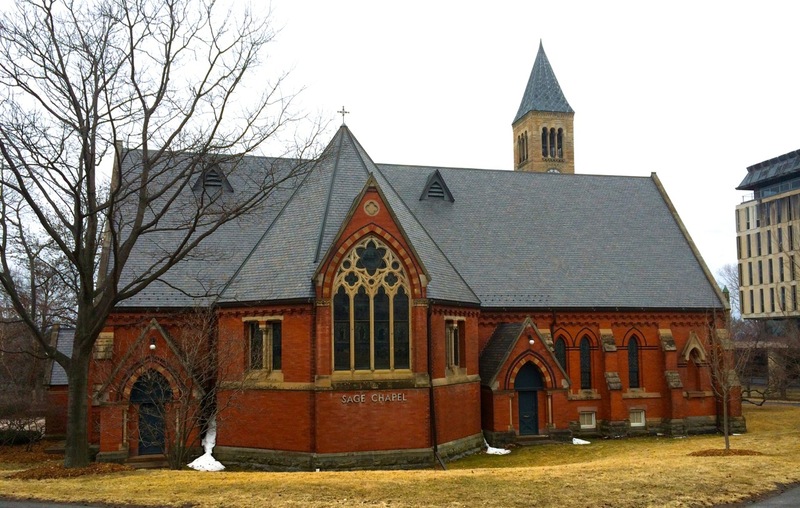 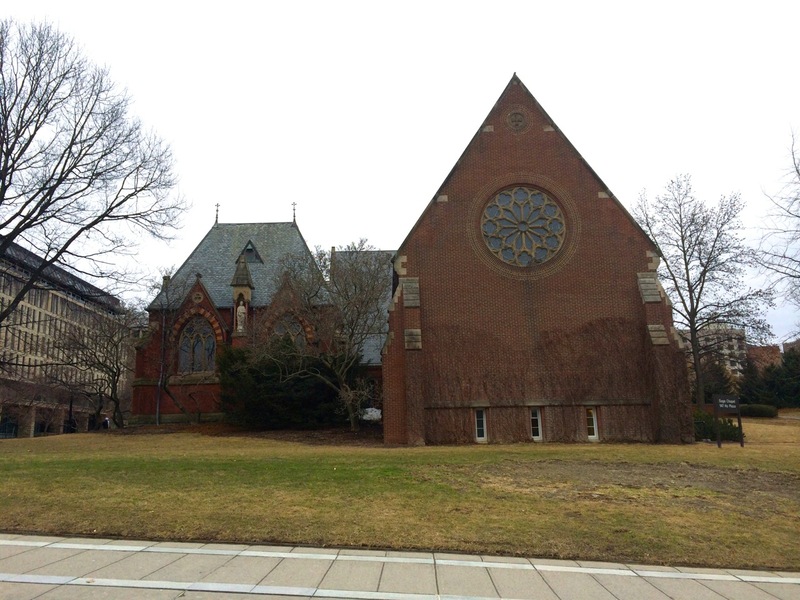 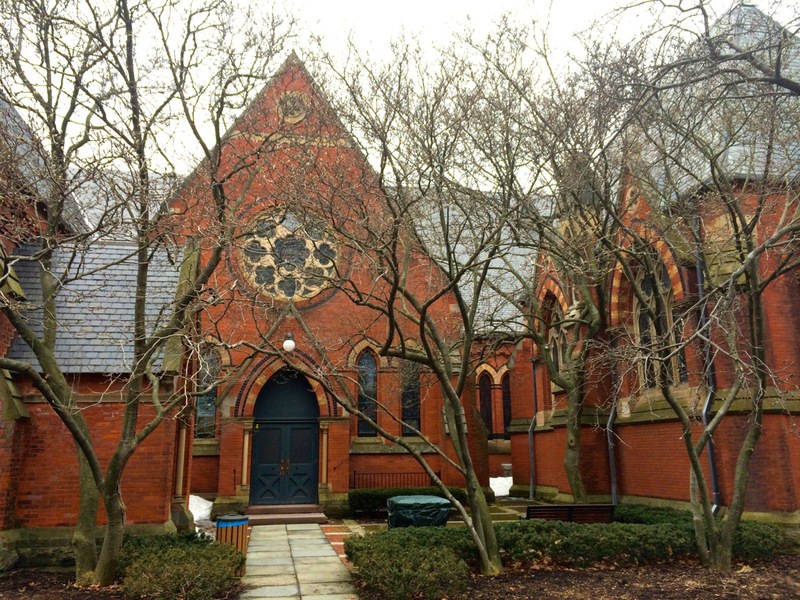 The original Chapel was built in 1873, and was designed by Reverend Charles Babcock, one of the founding members of the American Institute of Architects (AIA), and Cornell’s first Professor of Architecture. 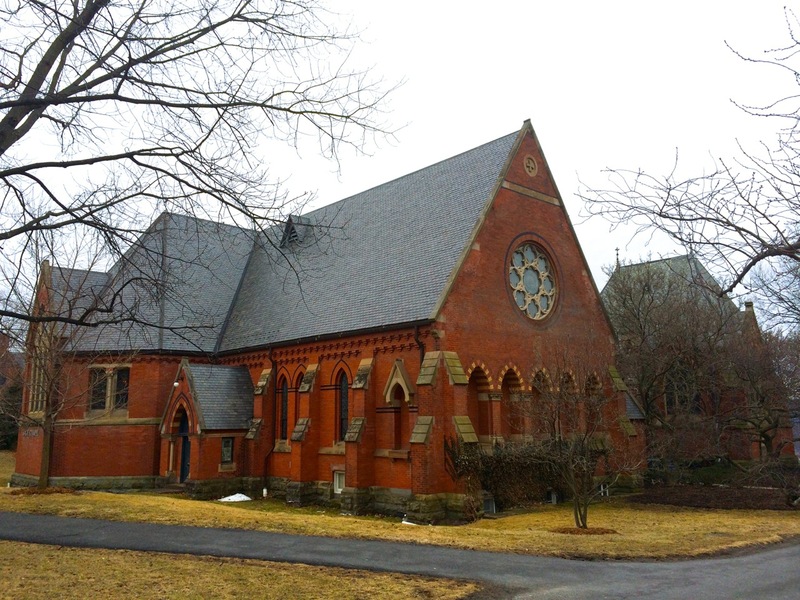 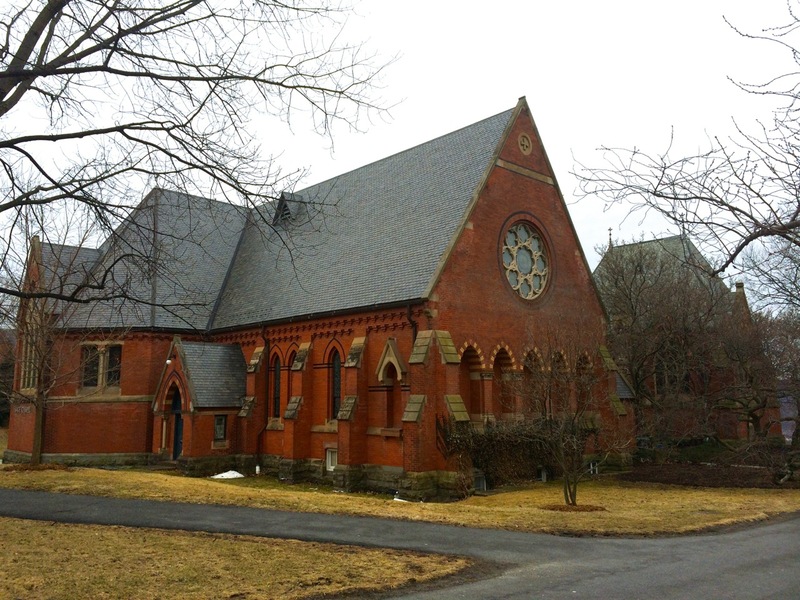 It was the first non-denominational chapel built on a college campus in the United States, a gift from Henry William Sage, a lumber-magnate and early benefactor of Cornell. 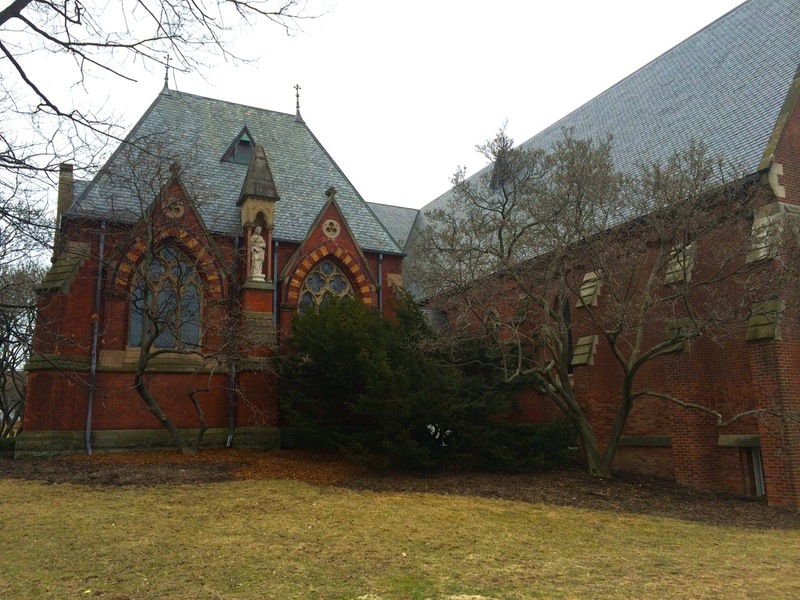 The Chapel has undergone four separate additions, with the Memorial Chapel addition in 1882, the 1898 addition, the 1903 addition, and the 1940 addition (pictured above), all of which maintained a design consistent with the original building. 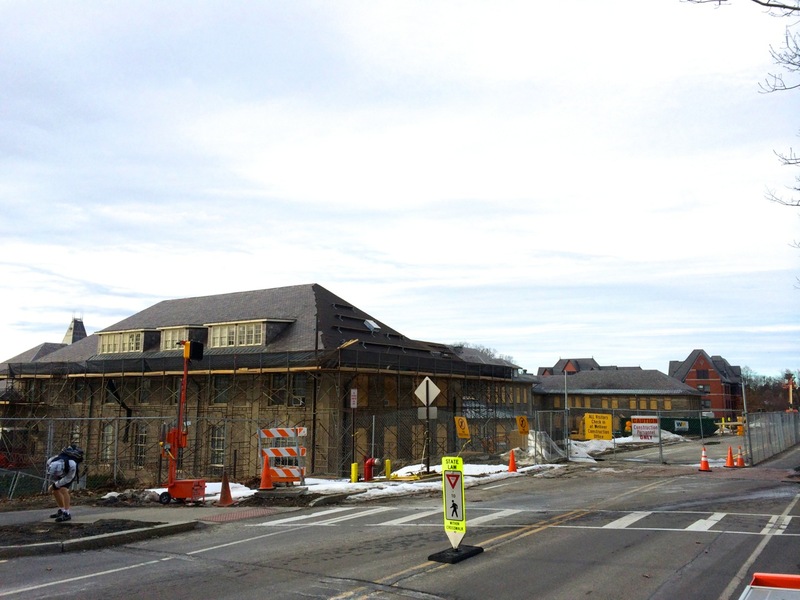 The planned work is fully detailed in the application to the Ithaca Landmarks Preservation Commission. 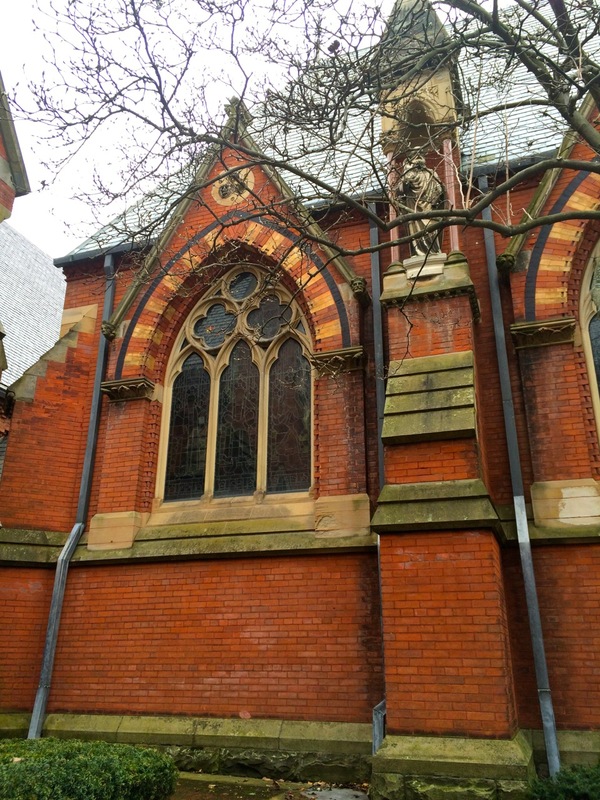 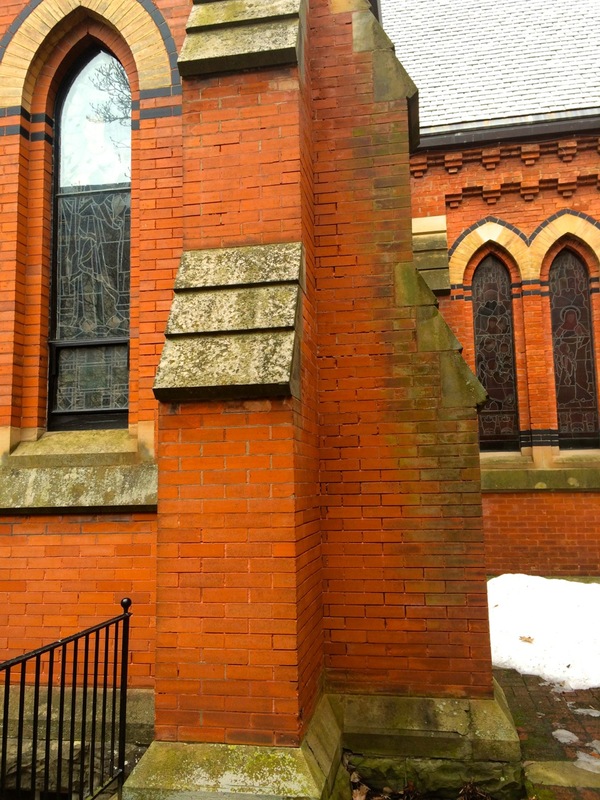 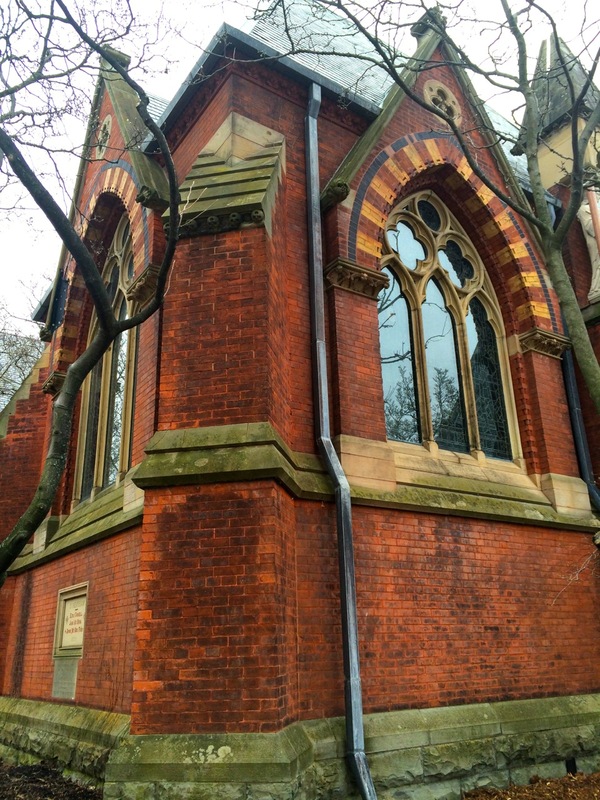 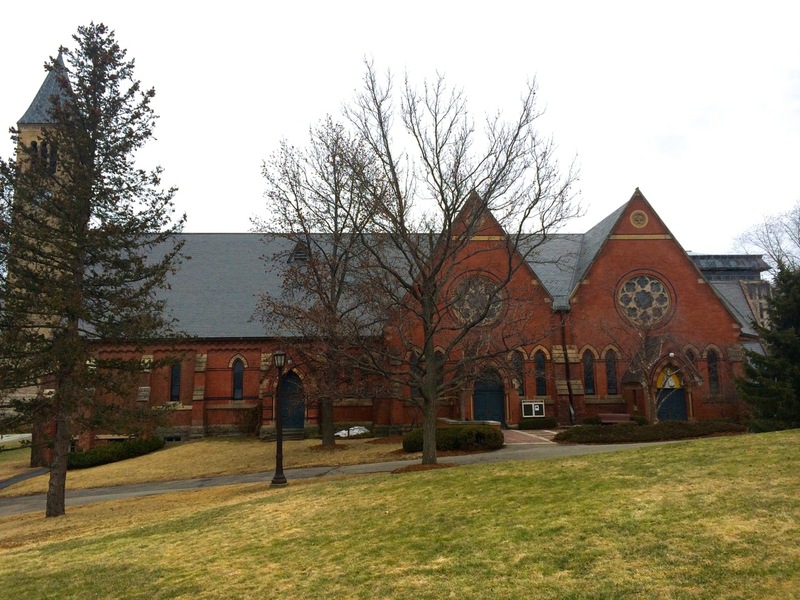 The design team has documented areas where the ribbon slate is nearing the end of its service life, necessitating replacement, flashing and seams on the roof (especially rake and gable ends) that must be reconstructed, and deteriorated brick and stone masonry on the memorial chapel. 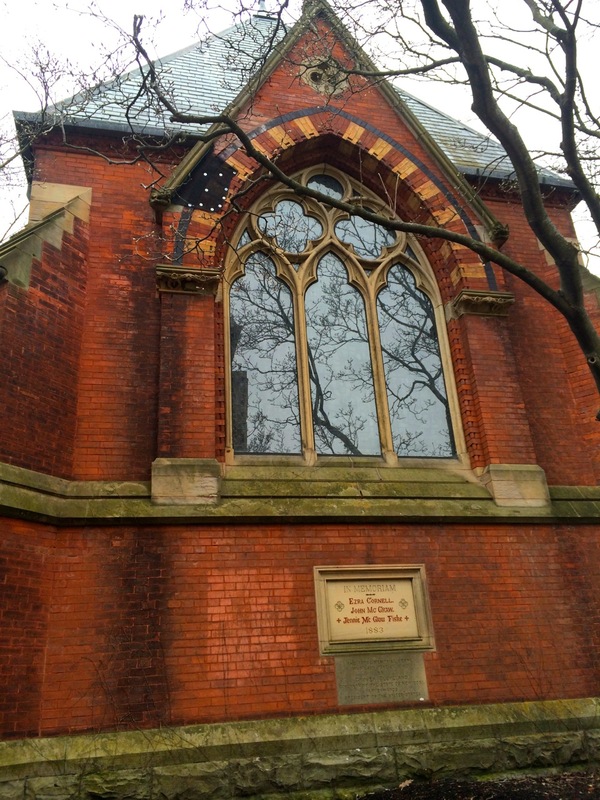 There are also a few stained glass windows that have gap seams to repair, work to be done by stained glass conservator E.S. 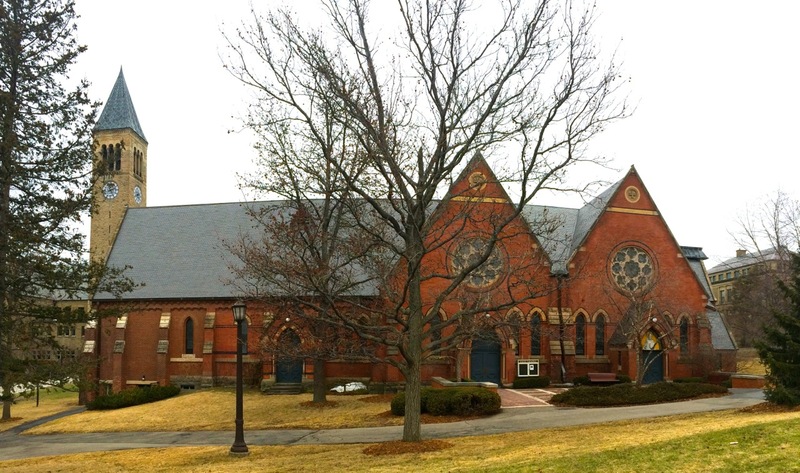 Taylor Studio. 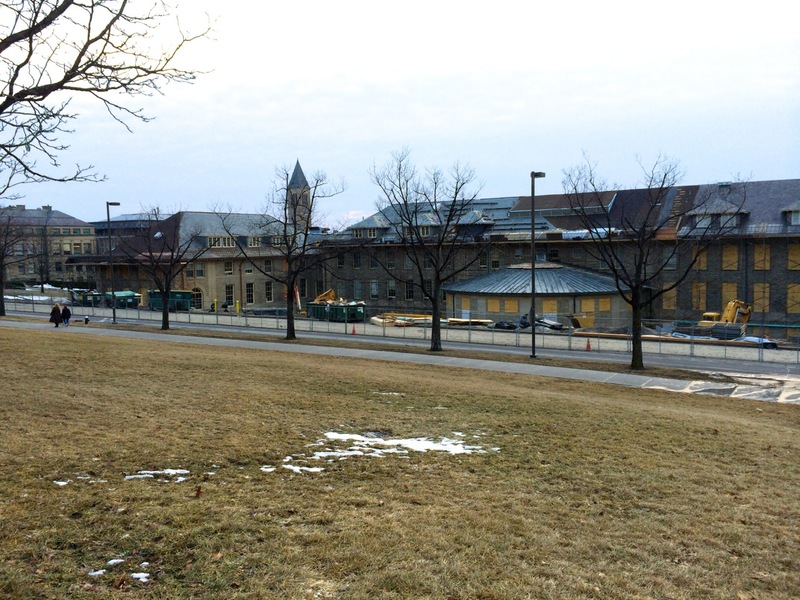 Several items will require repainting decorative finishes, work to be done by John Tiedemann, Inc.
Cornell University’s Klarman Hall project has posted a schedule for the next six months, while LeChase Construction and Welliver have completed more roofing work throughout the month of march. 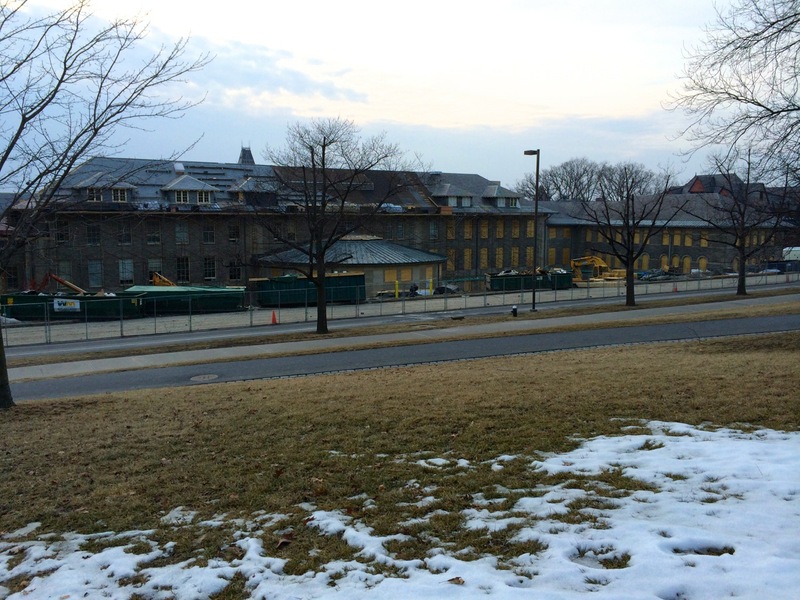 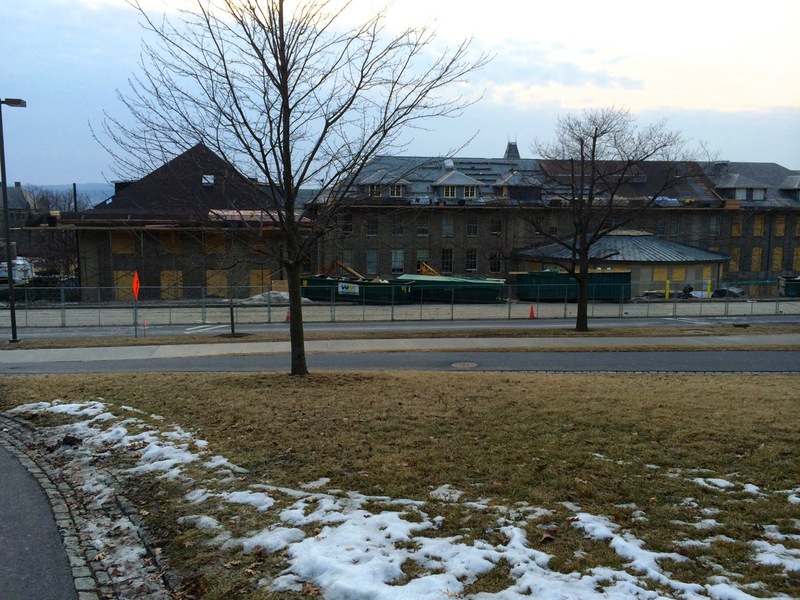 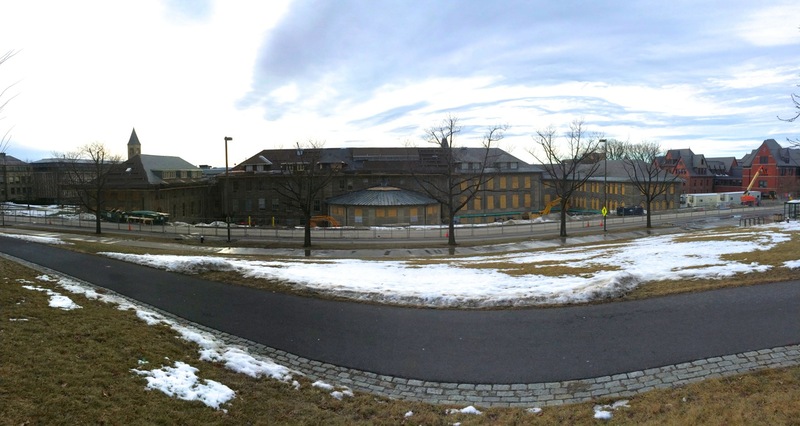 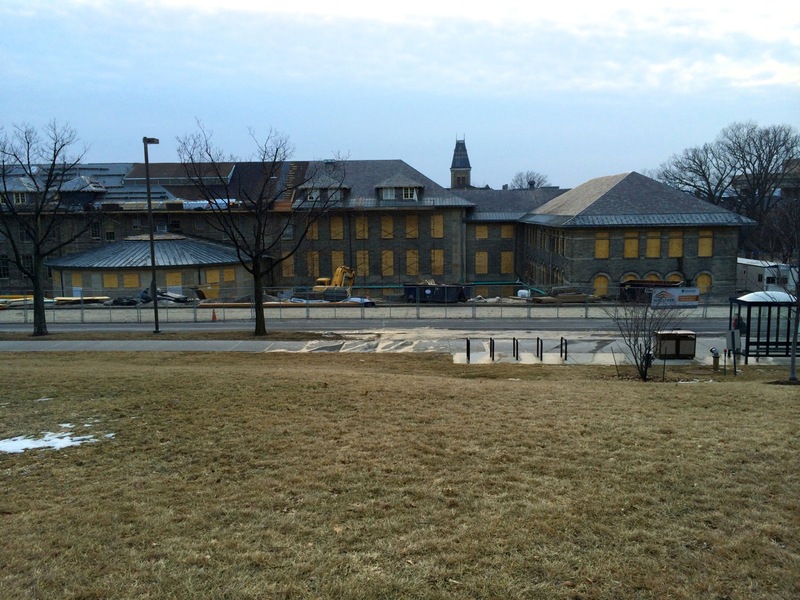 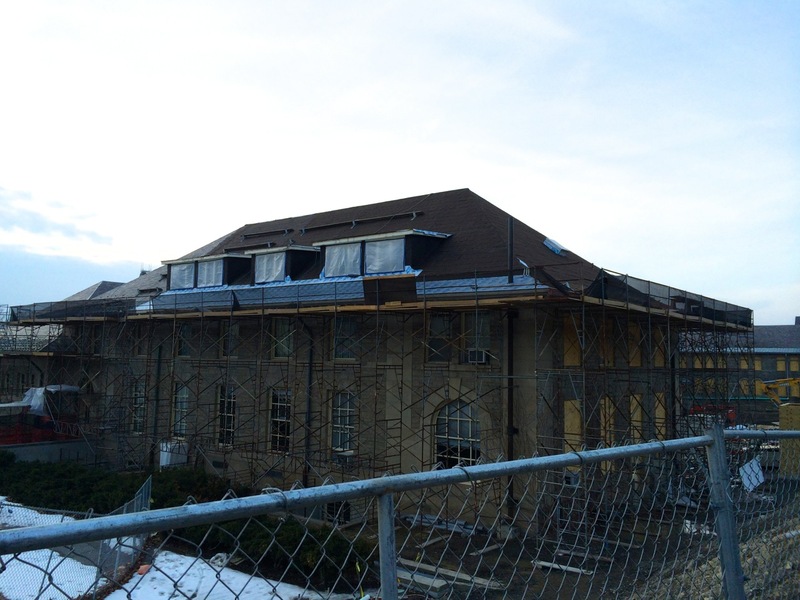 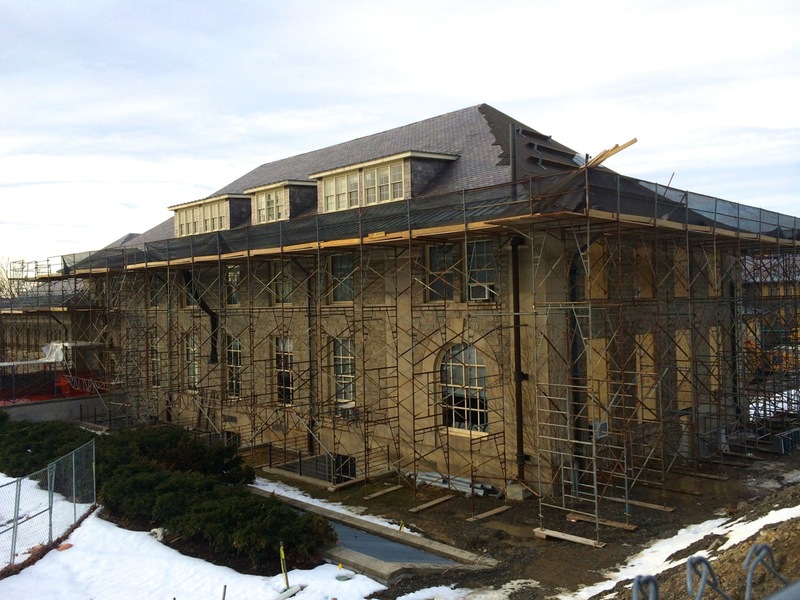 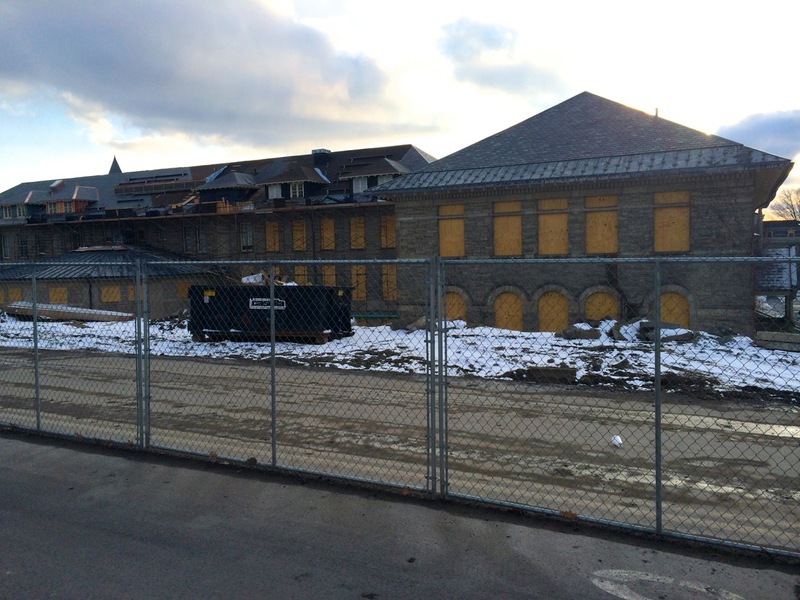 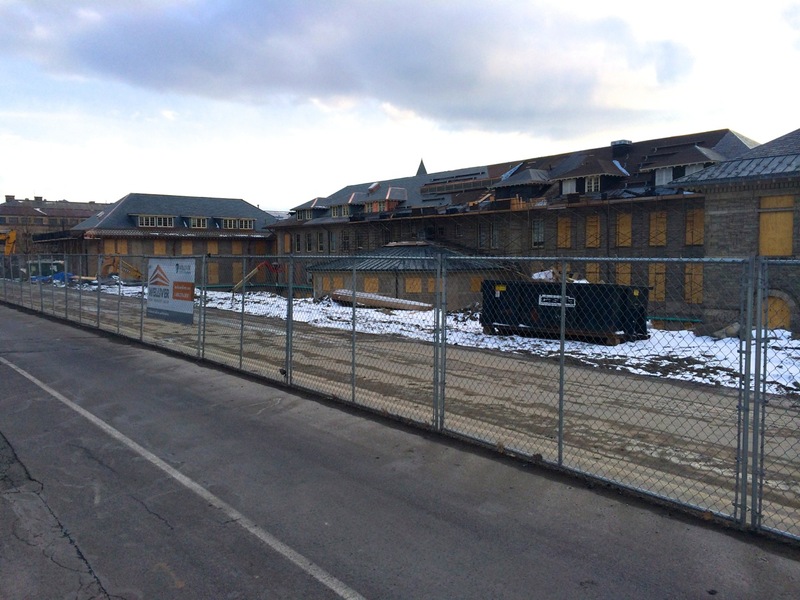 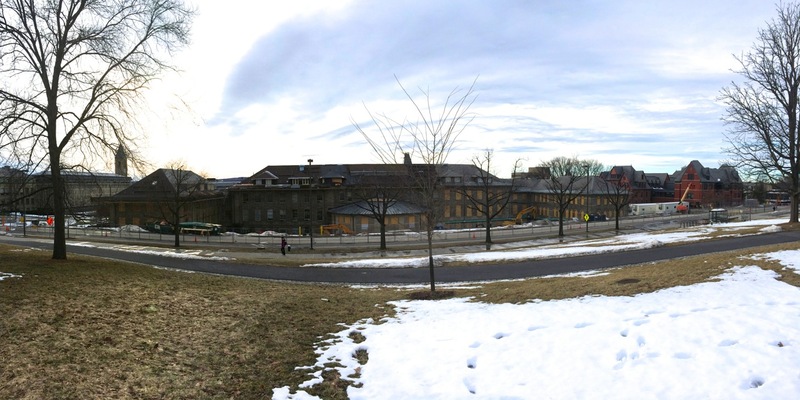 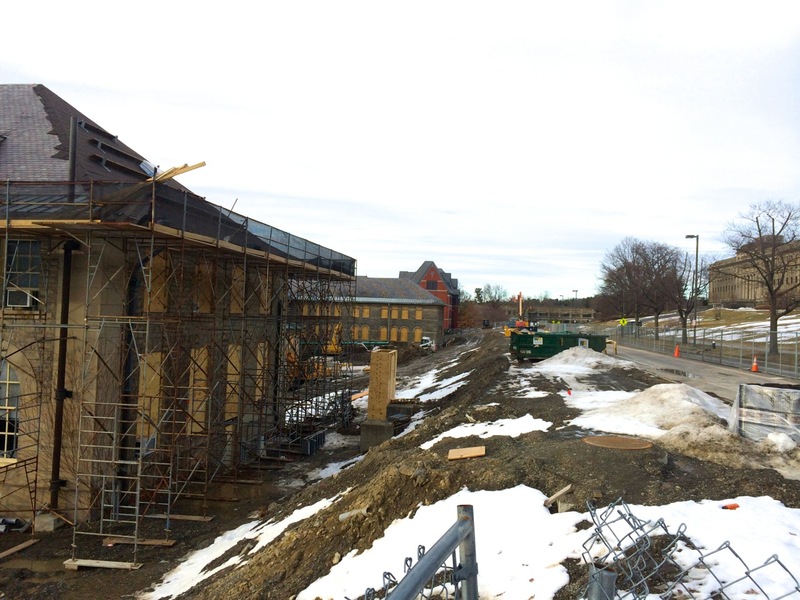 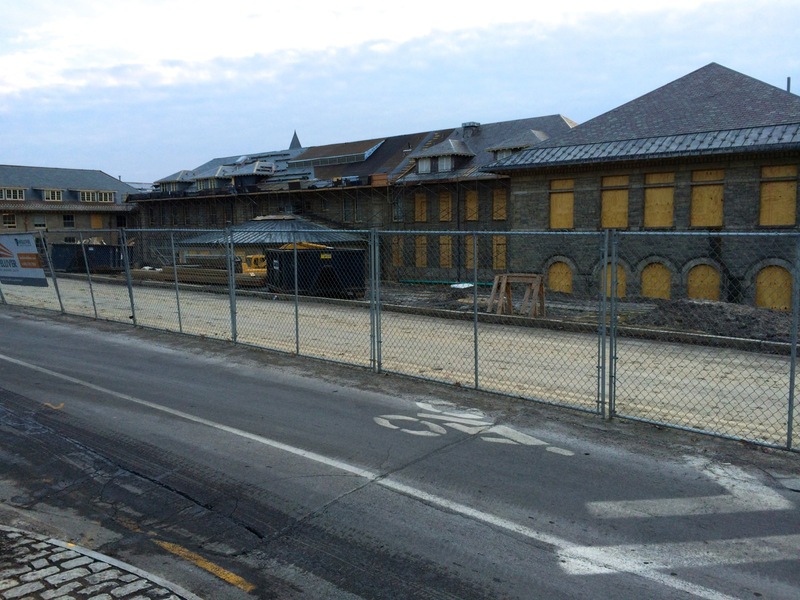 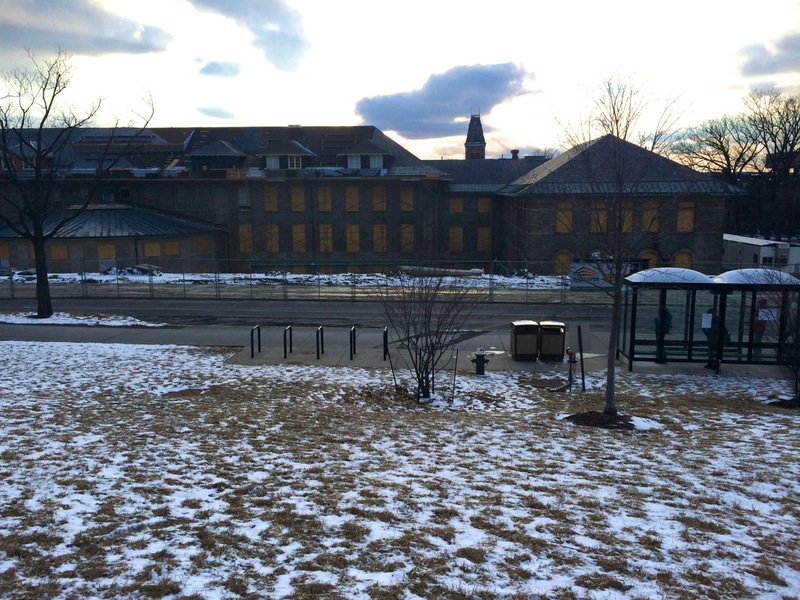 The southern wing’s roof looks nearly complete, along with most of the southern portion of the main building, as the previous slate and metal roofing has been completely removed, re-surfaced with synthetic underlayment, and replaced with new slate and metal. 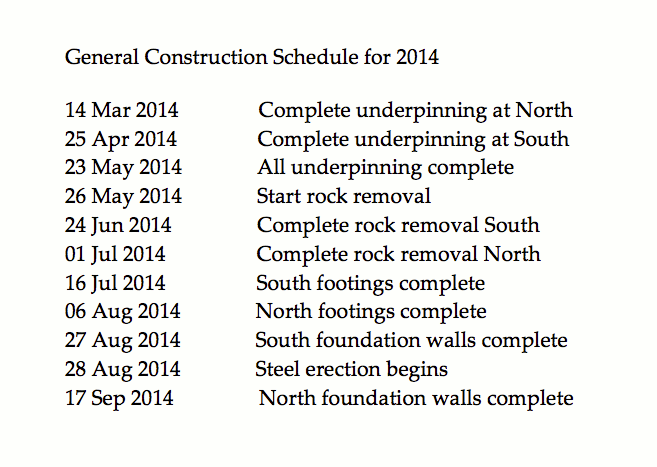 Underpinnings for Goldwin Smith and Klarman’s foundation have begun installation as indicated on the schedule. 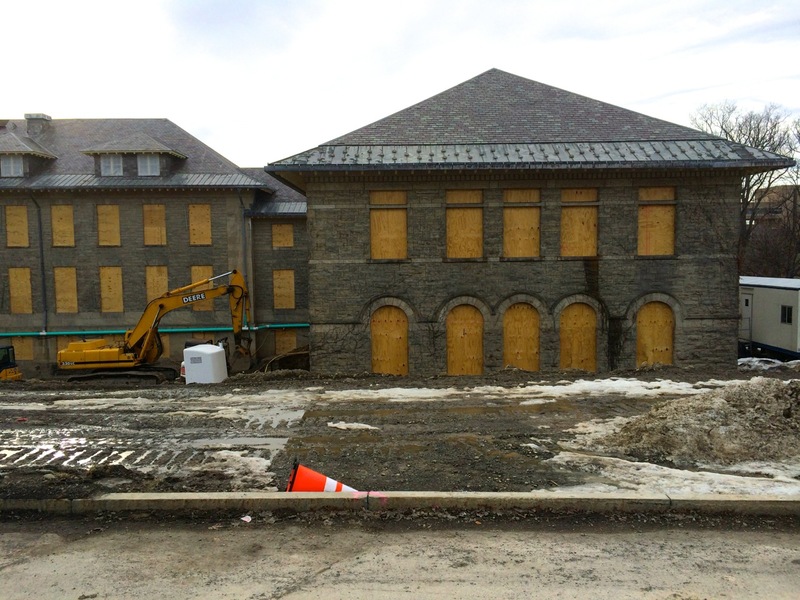 They’re typically used to support an existing foundation by digging underneath section by section, and backfilling the trench with concrete to provide additional support and stabilization. 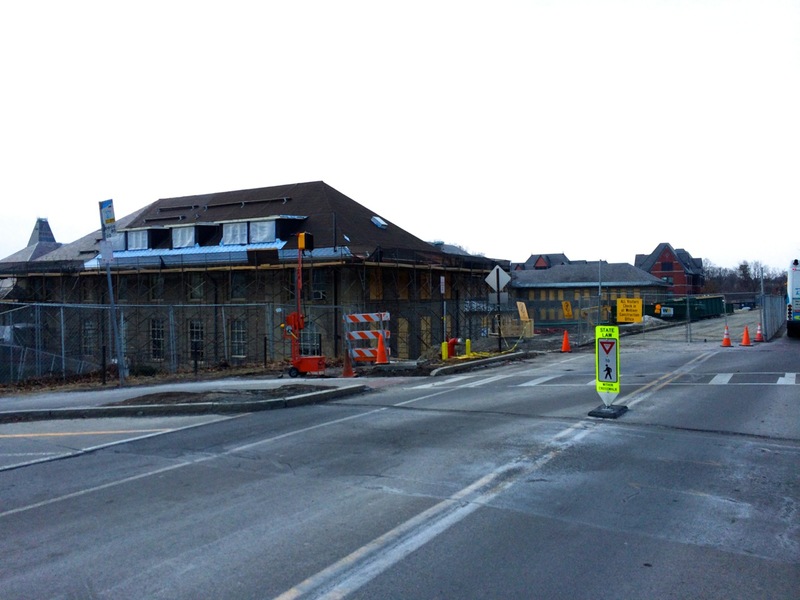 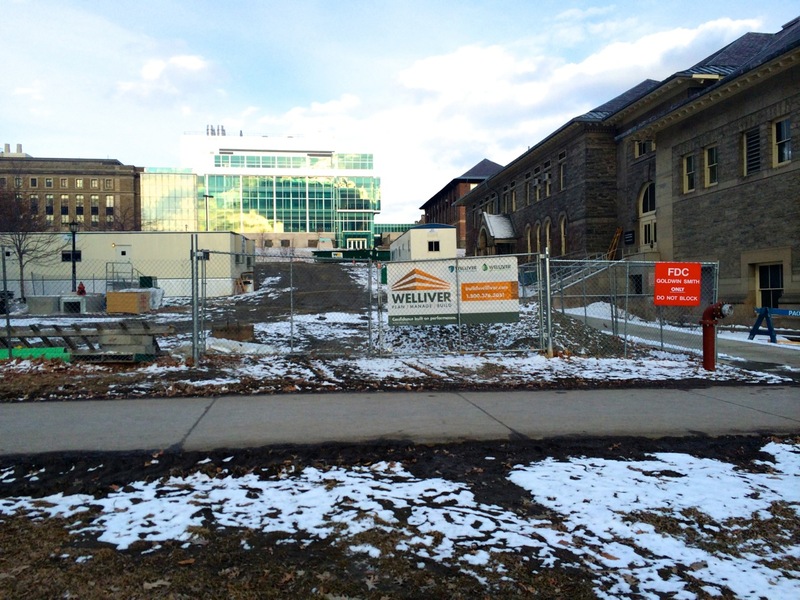 The crews will be digging all along Klarman’s future footprint, and along East Avenue. 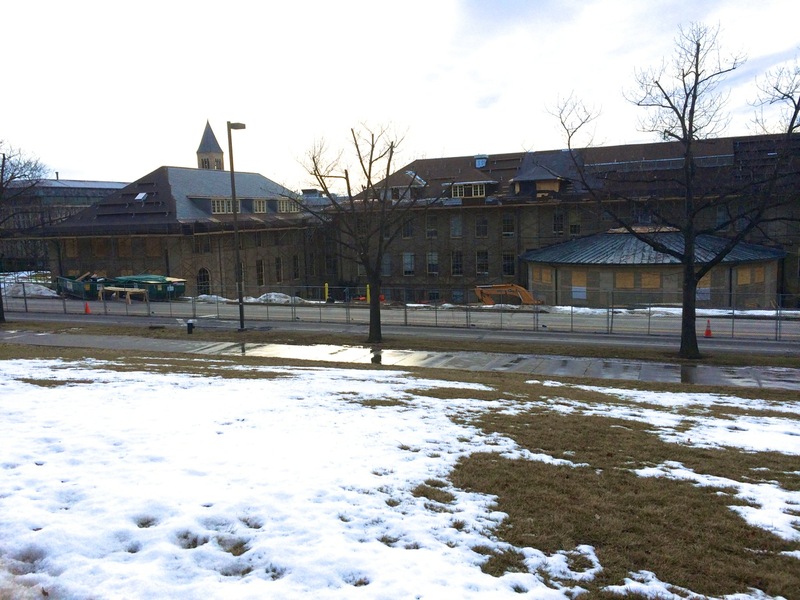 The future weight of Klarman Hall would likely have an adverse affect on existing footings as the new building settles into the soil, so the work will ensure that the existing foundations are safe and sufficient. 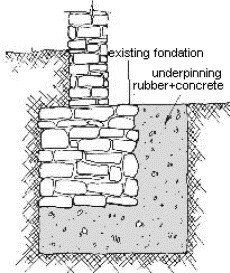 For certain situations (especially repairing unlevel settling), a building’s foundation is actually jacked up with hydraulics to fix the level. 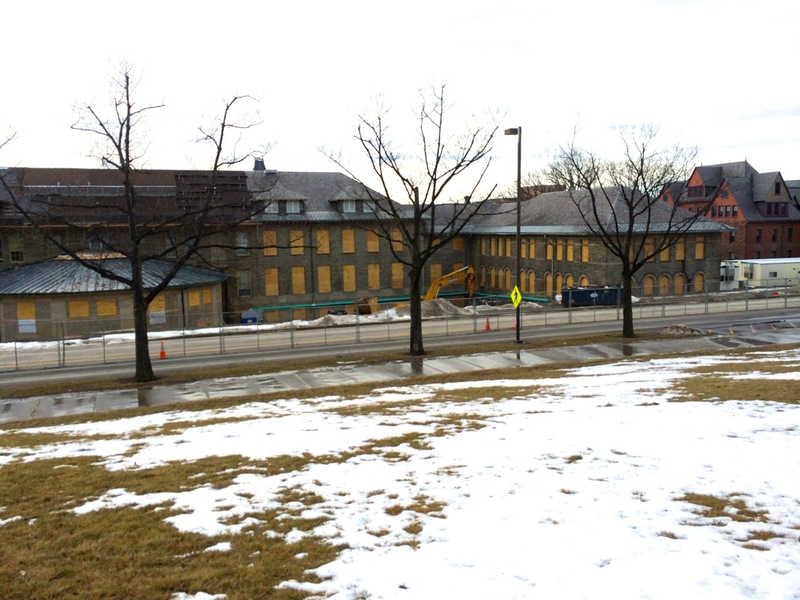 A few more windows on the east side of Goldwin Smith Hall have been boarded-up, and roofing work as part of the enabling work scope for the Klarman Hall project has been proceeding (LeChase Construction), as the entire existing slate and metal roofing materials are replaced with new metal, flashing, and slate pieces. 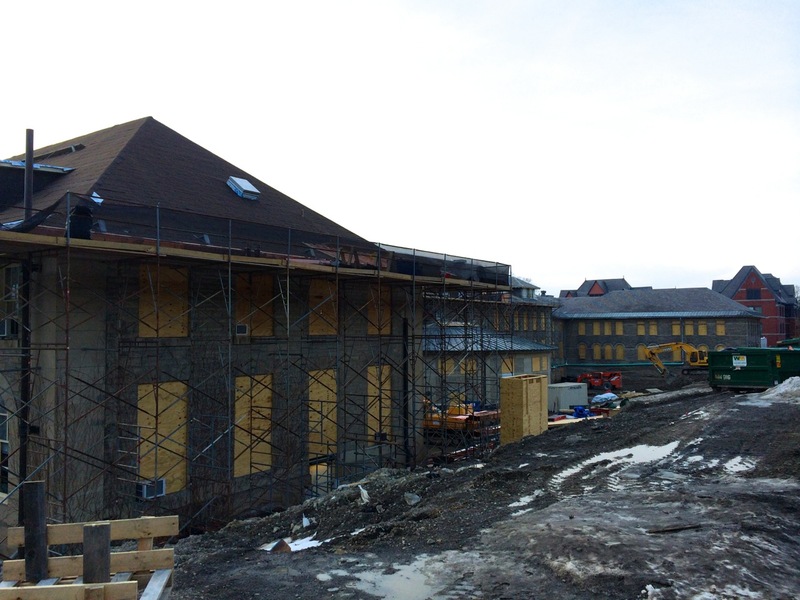 If I’m not mistaken, I believe by this point, the entire north wing, the northern-central section, and the southern and northern slopes of the south wing have new slate installed. 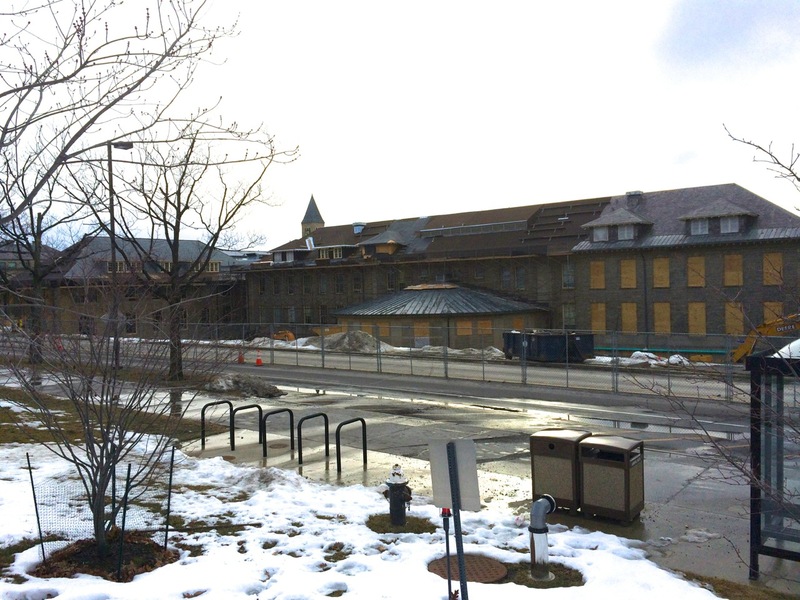 The Cornell Chronicle posted an article about how the temperatures have been affecting the project. 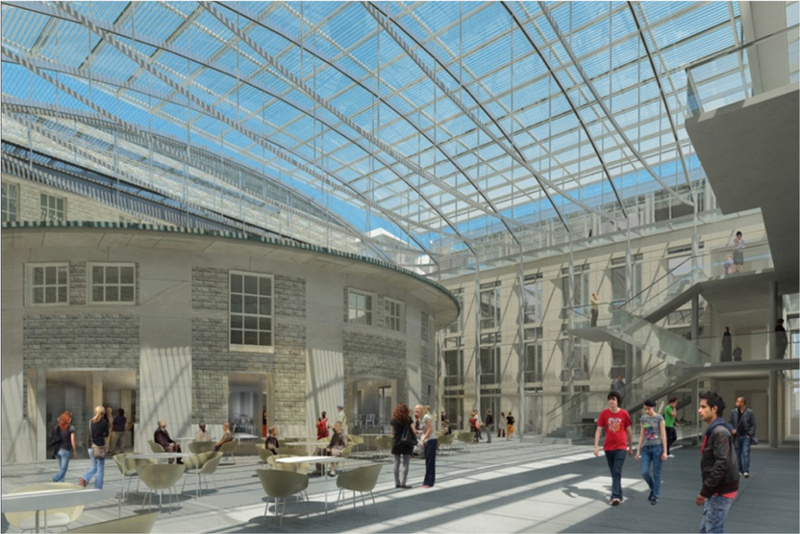 The target completion for Klarman Hall is late 2015, with 33,250 square feet of new space going for LEED Platinum certification, a 350 seat auditorium, and a large inner-atrium space, opening-up the Goldwin Smith rotunda for cafe-service areas and entry/egress into Goldwin Smith. 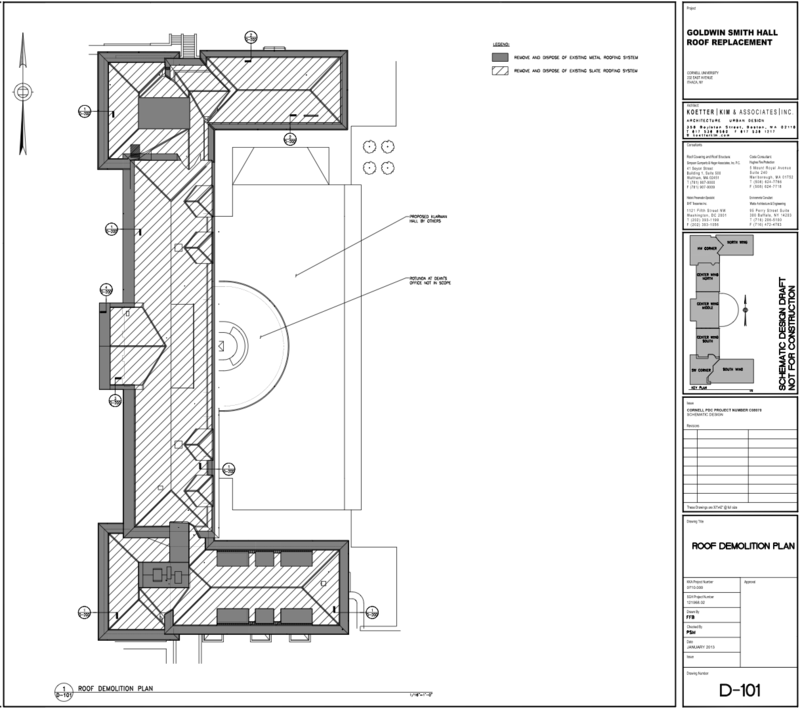 Embedded images for each of the four floor plan levels are here in the previous post. 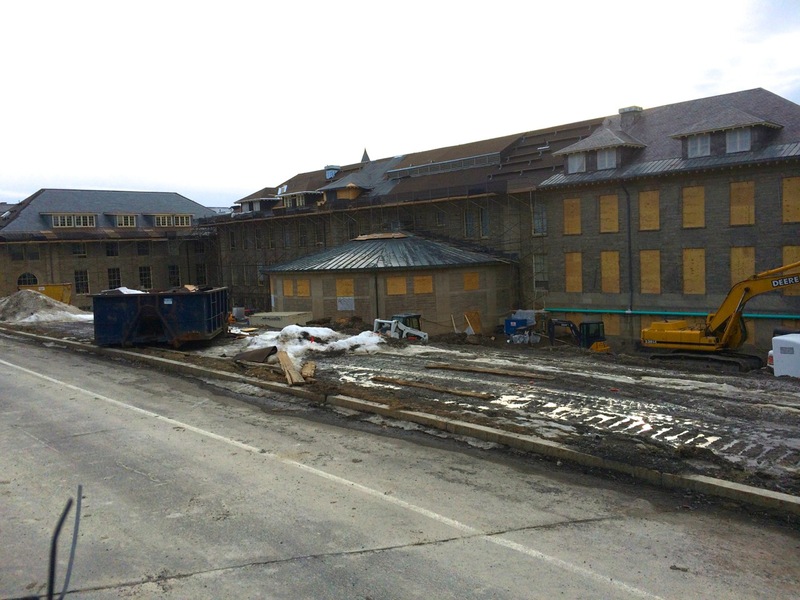 Welliver is the general contractor on this project.